Anne Arran is a former national coach for the Junior British Competition Climbing Team, and for three years supported 12 to 19 year old members of the elite squad. She has also coached other juniors who subsequently have made it onto the British Squad or Team. As well as developing high performance policy and structure for the British Mountaineering Council’s High Performance Steering Group Anne has, with Dave Binney (MMedSci) and Jagged Globe’s Mike Rosser, run Fundamentals workshops for those instructors wishing to coach young climbers. As well as having been British Champion, Anne also holds the national Single Pitch Award (SPA), Mountain Leader (ML) and International Mountain Leader (IML) awards. She is MIA trained. She formally ran an instruction business from the Foundry Climbing Centre in Sheffield with regular children's clubs called 'the spider club' and 'competition club' for 6-12 years and 12-17 years. With the help of her knowledge some of the spiders made it to national and even international competitions. She has provided many types of outdoor activity for Youth Service, schools, agencies and individuals, as well as working for local activity centres and with people with special needs. 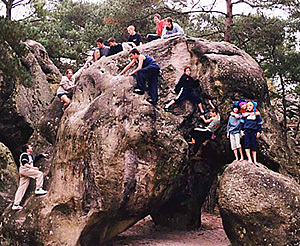 She has run or supported many seminars on equal opportunities or disability, and led many masterclasses for climbers. After selling the business she worked as Youth and Training Officer for the British Mountaineering Council. Here she arranged many events including international exchanges, some of which were funded by the European Union. 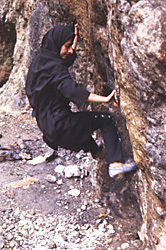 She also took part in a coaching visit to support female rock climbers in Iran. Having left the BMC she is now President of the UIAA Youth Commission (international commission for climbing and mountaineering), which she somehow finds time for when she isn’t away on expedition or busy with photo-journalism and coaching. To see the UIAA Youth Commission’s 2008 Global Youth Summit programme click here. Follow this link for more details of the UIAA Youth Commission.